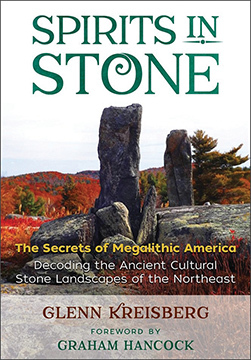 Presenting a comprehensive field guide to hundreds of lost, forgotten, and misidentified megalithic stone structures in northeastern America, Glenn Kreisberg documents many enigmatic formations still standing across the Catskill Mountain and Hudson Valley region, complete with functioning solstice and equinox alignments. Kreisberg provides a first-person description of the “Wall of the Manitou,” which runs for 10 miles along the eastern slopes of the Catskill Mountains, as well as narratives about related sites that include animal effigies, reproductive organs, calendar stones, enigmatic inscriptions, and evidence of alignments. Using computer software, he plots the trajectory of the Hammonasset Line, which begins at a burial complex near the tip of Long Island and runs to Devil’s Tombstone in Greene County, New York. He shows how the line runs at the same angle that marks the summer solstice sunset from Montauk Point on Long Island, and, when extended, intersects the ancient copper mines of Isle Royal in Upper Michigan. He documents a several-acre area on Overlook Mountain in Woodstock, New York, with a grouping of very large, carefully constructed lithic formations that together create a serpent or snake figure, mirroring the constellation Draco. He demonstrates how this site is related to the Serpent Mount in Ohio and Ankor Wat in Cambodia and reveals how all of the vast, interlocking sites in the Northeast were part of an ancient spiritual landscape based on a sophisticated understanding of the cosmos, as practiced by ancient Native Americans. While modern historians consider these sites to be colonial era constructions, Kreisberg reveals how they were used to communicate with the spirit world and may be remnants of a long-vanished civilization. SPIRITS IN STONE: The Secrets of Megalithic America By Glenn Kriesberg, Foreword by Graham Hancock. 432 Pages. 7x9 Paperback. Illustrated. Bibliography. Index.